Tucked away in the foothills outside of Angels Camp, Greenhorn Creek Resort creates an incredible golf, dining and lodging experience in the Sierra Nevada Gold Country. 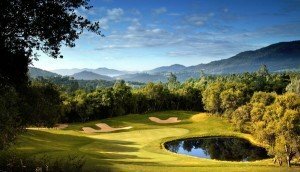 Robert Trent Jones II and Mother Nature have teamed up to offer 18 holes of championship golf with five sets of tees ranging from 4,882 to 6,749 yards make Greenhorn Creek Resort both challenging and enjoyable as the winds itself through the beautiful terrain of the Sierra Foothills. For those whose golf skills could use a little refining, Greenhorn Creek Resort also offers a Golf Academy managed by PGA Professional, Chris Borrego, with assistance from PGA Apprentice Professional, Allan Ramorini. Combined, they have over 25 years of golf instruction experience working with both adults and the younger set. With two restaurants onsite, you’ll not go hungry. The award-winning CAMPS Restaurant serves up more elegant fair and offers live music, a full bar and a wine bar. As a thoughtful alternative, the resort’s Patio Grille was designed for folks still enjoying their day — a quick bite and a nip and they can be on their way. Just eight miles south of Murphys, you can be down and back within the day.